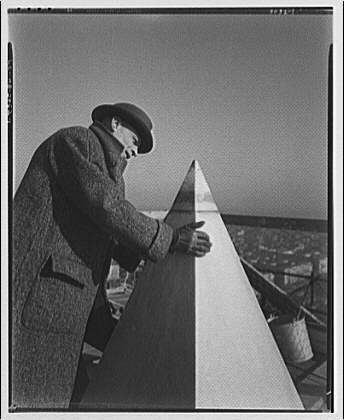 On December 6, 1884, workers placed the 3,300 pound marble capstone on the Washington Monument, and topped it with a nine-inch pyramid of cast aluminum, completing construction of the 555-foot Egyptian obelisk. Nearly fifty years earlier, the Washington National Monument Society choose Robert Mills's design to honor first American president and founding father George Washington. The privately-funded organization laid the monument's cornerstone on Independence Day, 1848, in Washington, D.C. 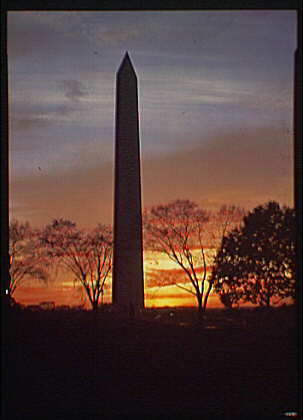 The Washington Monument is a large, tall, sand-colored obelisk near the west end of the National Mall in Washington, D.C. It was constructed to commemorate the first U.S. president, George Washington. The monument, made of marble, granite, and sandstone, is both the world's tallest stone structure and the world's tallest obelisk in height standing 555 feet 5⅛ inches (169.294 m). There are other monumental columns (which are neither all stone nor true obelisks) which are taller. [n 2] It is also the tallest structure in Washington D.C.. It was designed by Robert Mills, an architect of the 1840s. The actual construction of the monument began in 1848 but was not completed until 1884, almost 30 years after the architect's death. This hiatus in construction happened because of co-option by the Know Nothing party, a lack of funds, and the intervention of the American Civil War. A difference in shading of the marble, visible approximately 150 feet (46 m), or 27%) up, shows where construction was halted for a number of years. Its cornerstone was laid on July 4, 1848; the capstone was set on December 6, 1884, and the completed monument was dedicated on February 21, 1885. It officially opened October 9, 1888. Upon completion, it became the world's tallest structure, a title it inherited from the Cologne Cathedral and held until 1889, when the Eiffel Tower was finished in Paris, France. The Washington Monument reflection can be seen in the aptly named Reflecting Pool, a rectangular pool extending to the west toward the Lincoln Memorial.